I was sitting at my computer when the screen saver came on. What? Had I fallen asleep? I haven’t ever done that. Wait! That’s not a screen saver. I’m awake. I’m typing. That’s a live brown marmorated stink bug walking across my computer screen. Did he like my draft blog so much that he flew down to read it at close range? Resigned to catching yet another stink bug, I retrieved our soapy-water bottle, our Stink Bug Collector, from the kitchen and was about to introduce the stink bug to bubbly swimming when I had an idea. Hummm. Clear text from screen. 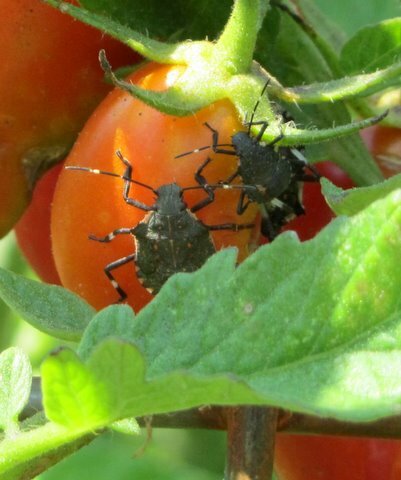 Type something topical—about stink bugs. Grab camera and take photo. Then introduce bug to suds. What do you think? Is the photo worthy of screen-saver status? I don’t think so. 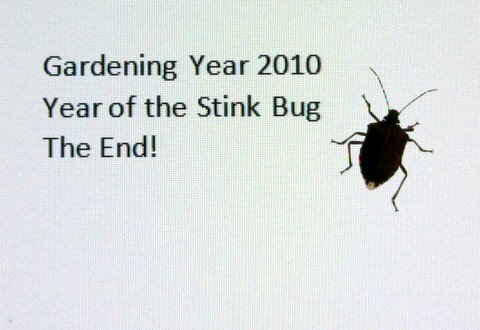 But it seems so appropriate as 2010 ends—what I call the Gardening Year of the Stink Bug. ugh – the last thing we need is a stink bug screensaver. I've seen a bunch today – maybe due to the unseasonably warm weather? Double ugh, Wendy. Yes, we're collecting 10 to 15 bmsb's a day inside our house, fewer on colder days, more on warmer days. We're very tolerant of crawling things, but after catching hundreds since colder weather set in in October, we're tiring of the battle.